WHAT TO WEAR POST PREGNANCY? An issue many women have to deal with post-delivery is the distress of not being able to fit immediately back into their pre-pregnancy wardrobes. Following the birth of your baby and in the early stages of breast-feeding, you might be overwhelmed by the feeling that your body will never be the same and that you’ll never be able to wear what you used to. The important thing to remember is that with a little exercise you will fit back into your pre-pregnancy clothes sooner than you think. But in the meantime, with maternity styles so chic, you may never ever want to! Pregnancy weight gain is normal and necessary. Among other things, it’s your body’s way of preparing for your new role as a breastfeeding mother. In addition to the extra weight, you will probably have changes to your body shape – larger breasts, wider hips... Unfortunately this does mean you may not be able to fit right back into your fab pre-pregnancy wardrobe. It’s small consolation to have a cupboard full of great clothes when all your old favourites remain on their hangers, too small and too tight. With the little one taking up all your energy, the last thing you want is the daily stress of trying to work out what fits your new body. The early stages of the post-delivery phase are all about learning ways to dress which flatter your new figure and make you feel great after having a baby. Luckily, we can help!! Once you and baby have settled in back at home, we say it’s time to go shopping. Shopping online at Queen Bee is the perfect solution when actually getting out of the house with a new baby in tow seems impossible. Retail therapy is a tried and tested way to avoid the blues, and what better way to celebrate the arrival of your baby than the purchase of some absolutely fabulous new clothes? With so many gifts arriving for your new baby, we think mothers need some spoiling too. Queen Bee has a fantastic range of dresses, which work wonders for softening and flattering curves. They also work extremely well for those of you who actually find that they lose too much weight after delivery. These are dresses which are both comfortable and allow you to breastfeed in style. Check out the Brigette Tie Knot Nursing Dress in navy, burgundy or black made from a cotton/spandex or viscose/spandex blend for added comfort. Queen Bee also has full-length dresses, for any after-hours event you may attend in the period following the birth. 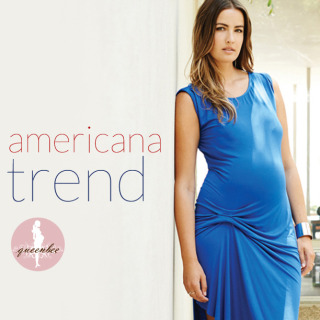 The Sienna Halter Maxi Nursing/Maternity Dress comes in rayon/spandex blend for extra softness and style. Team the dress’s low back with a casual uptwist and some sparkly drop earrings for a touch of glamour and no-one would ever guess you recently gave birth. The second step is to recycle all the clothes from your pregnancy period which still look good. One of the qualities we look for in lines featured at Queen Bee is their ability to adapt from your beautiful pregnant shape to your post-delivery body. Many of Queen Bee's maternity fashions can be worn well beyond delivery. If you shopped wisely, then most of the clothes from your second trimester should be a great fit. 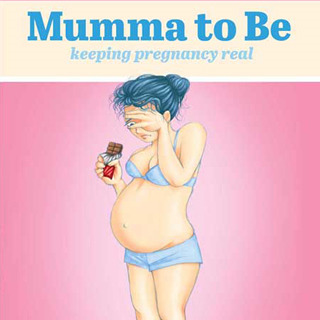 Queen Bee has a wonderful range of maternity thru to post-delivery delights to choose from. Try the French Nursing/Maternity Dress in a stunning red/pink viscose/lyrca blend, the Smocked Nursing/Maternity Sundress in orange, spring green or pure black in a cotton/spandex blend or a vibrant red 9th Street Nursing/Maternity Dress in a rayon/spandex blend. For warmer weather, the organic cotton Crossover Organic Cotton Nursing Nightdress in purple or raspberry can even double as a sun dress at the beach! And of course, similar styles can be found in more neutral colours as well. By sticking to block colours, your outfit can be dressed up or down as much as you choose. Ethnic beads and a denim jacket can take you to far-away places, and if you’re looking for a warm solution to the windy walk to the park, the shops or even to work, just grab a Nursing/Maternity Cowl Top in black, a pair of Oasis 3/4 Length Maternity Leggings, and some walking boots for comfort! Step three is all about remaining comfortable yet chic. When you have just given birth, comfort is paramount. So you know the drill, stick to those soft and gentle fabrics and elasticised waists. Keep away from anything stiff or unforgiving. Luckily for us all, tunic tops are in fashion right now. Tunic tops are great way to recycle your pre-pregnancy tops, they are extremely flattering when you’ve just given birth and they look great with fitted straight leg or skinny jeans. The trick to wearing tunics well is in the layering. Try a Nursing/Maternity Puff Sleeve Tunic in a viscose/lycra blend with a pre-pregnancy shirt from your wardrobe. Remember to leave the lower buttons of the shirt undone for added comfort. They’ll be hidden under the tunic so no one will see. Throw on some chunky accessories or a scarf. Team with a pair of cotton/elastane Aurelie Straight Leg Maternity Trousers or Twiggy Maternity Black Cat Jeans, your favourite heels and you’re ready to strut your stuff, in post-pregnancy fashion forward comfort!